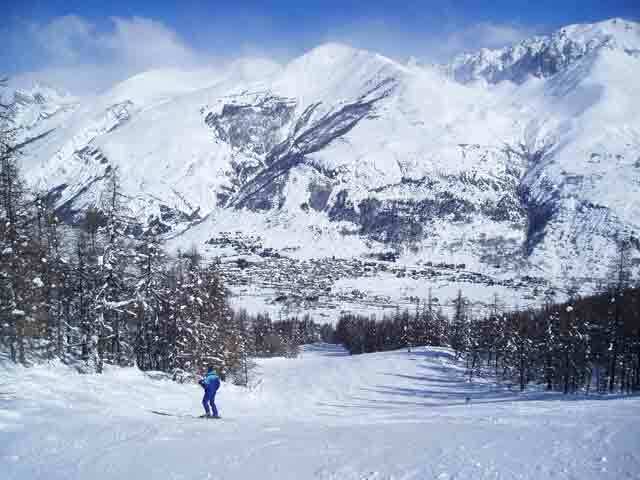 The skiing in Serre Chevalier is suitable for all skiers. Snowmaking on the lower slopes ensure access to the village on skis from the start to the end of the season. The nursery slopes are at the foot of the main pistes, only a short walk from the apartment. For the more adventurous, there are 250kms of pistes to explore in the area, and a great choice of off-piste itineraries for the experts. 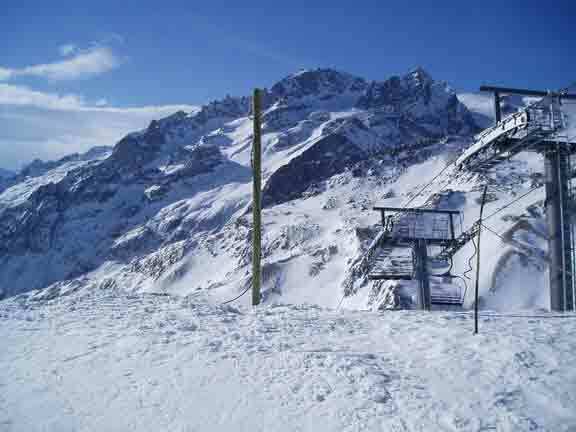 The off-piste mecca of La Grave/La Meije is only a 30 minute drive across the Col du Lauteret. 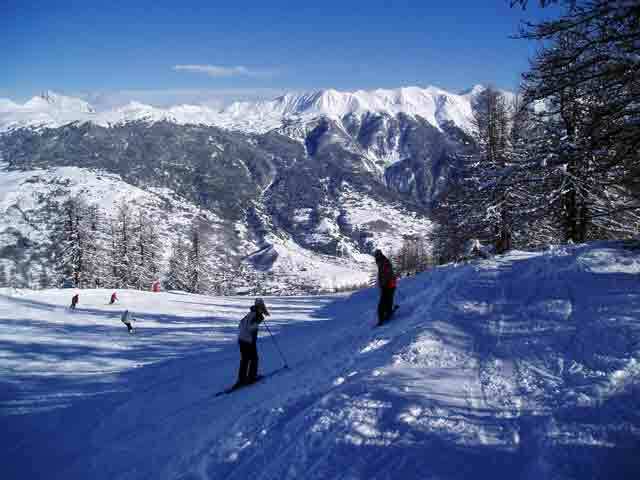 The skiing is divided into three sections, Briancon, Serre Che(Chantemerle and Villeneuve) and Monetier. All are linked, and a good intermediate can ski from one side of the area to the other and back in a day. The area was once noted for it’s vicious drag lifts, but many of them have now been replaced with 6 seater high-speed chairlifts. Plenty of trees means you can ski in all conditions, and snowmaking on all the lower slopes ensures your return to the villages on your skis or board even in April. A 6 day adult ski pass is €181 . Some of the highlights are the Cucumelle, a long broad red run that links Monetier to Villeneuve, stop for a drink or even lunch on the terrace of the Pi-Mai at Frejus, look for the signs as it is easy to miss them if you are skiing fast. The black Luc Alphand piste is the main return run to Chantemerle, do it early in the day to avoid the crowds. A green run cuts across from time to time if you want to bail out, although it is well within the capabilities of a decent intermediate skier or boarder. For good snow and less crowds the Eduits and Aguillete pistes in the Chantemerle sector, are quiet and seem to hold their snow well. A chair at the bottom takes you back to the main ski area. The back of the piste maps have a pink and orange itinerary marked on them. Follow the orange route from Monetier to Briancon on red pistes, and the pink route back, on mainly blue slopes. Stop in Monetier at the Peyra Juana for lunch, it’s small and cosy, with a wood-burning stove for cold days. Lovely Assiette de Montagnard or the Plat du Jour. If you don’t feel like it, skip the pistes down to the villages, and stick to the higher slopes. You will have even more time for a lunch stop. The routes are marked on the signposts too.There are several off-piste opportunties without straying far from the lifts, including the boulder field below the Prorel chair, and several routes down from the Cucumelle. Currently sunny and with great fresh snow awaiting those heading down for the start of the season. Loads of fresh snow has fallen on the resort, ensuring a good start to the season. We still have some late availability on offer for short breaks and for week of 16th-23rd December. and receive 5% off rental prices, and free ski locker at the bottom of the pistes. Current snow conditions are excellent going into the half-term period, and it is looking good for the rest of the season. With some fantastic early season conditions, why not enjoy a short break before Christmas. The ski area opens on the 13th December, and we are offering 10% discount off all remaining dates.